Potbelly Sandwich Shop Turns 40! Chicago, Ill. (May 16, 2017) — Everyone’s favorite sandwich shop is turning 40! Four decades ago, the first Potbelly Sandwich Shop brought toasty warm sandwiches to Chicago’s Lincoln Park neighborhood. Since then, Potbelly has expanded into neighborhoods across the country, providing Fresh, Fast & Friendly service in more than 400 shops throughout the United States. This summer, Potbelly is inviting fans to join in the birthday celebration through in-shop promotions, new menu items and awesome giveaways. The company will be commemorating the big 4-0 milestone with fans in each of their neighborhoods by offering 40 percent off Originals sandwiches on June 1st from 11 a.m. to 3 p.m.
Potbelly fans are invited to visit the Potbelly Facebook page to download this special offer to be redeemed in-shop on any Originals sandwich, including the signature A Wreck® sandwich and limited-time options like the new all-natural Turkey Fresco. Of course, no birthday celebration is complete without a sweet treat – and Potbelly is celebrating in style with not one but two limited-time birthday treats. 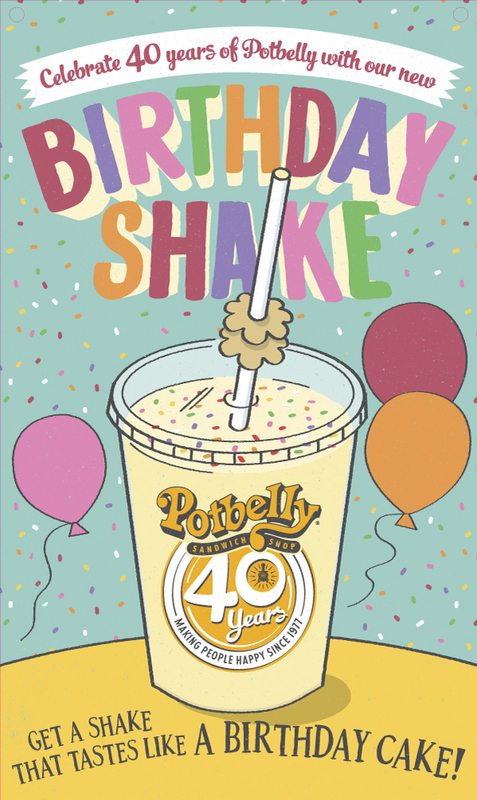 Beginning Tuesday, May 16, Potbelly will feature a Birthday Shake, a hand-dipped shake that tastes like a birthday cake, blended with Potbelly’s famous mini butter cookies and festive sprinkles. In addition, shops will be featuring a Marshmallow Crispy Bar – a classic combination of marshmallows and rice crispies, topped with birthday frosting and sprinkles. 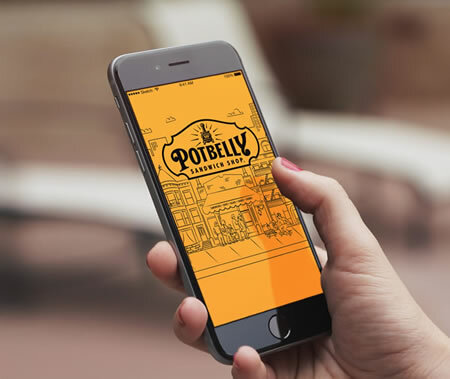 The recently launched Potbelly app offers order ahead and pay via phone for customers to jump the line and earn tasty treats by downloading the free app and signing up for Potbelly Perks. For complete rules and to learn how to enter without making a purchase, visit http://www.potbelly.com/40thbirthday. Fans are invited to follow along with the Potbelly 40th birthday celebration this summer in-shop and via the company’s Facebook, Twitter and Instagram channels. For more information about Potbelly Sandwich Shop, please visit www.Potbelly.com. Potbelly Corporation is a fast-growing neighborhood sandwich concept offering toasty warm sandwiches, signature salads and other fresh menu items served by friendly, engaging people in an environment that reflects the local community. We want to be your favorite neighborhood sandwich shop and “The Best Place for Lunch.” The company owns and operates more than 400 shops in the United States, and our franchisees operate more than 50 shops domestically, in the Middle East and in the United Kingdom. For more information, please visit our website at www.Potbelly.com.